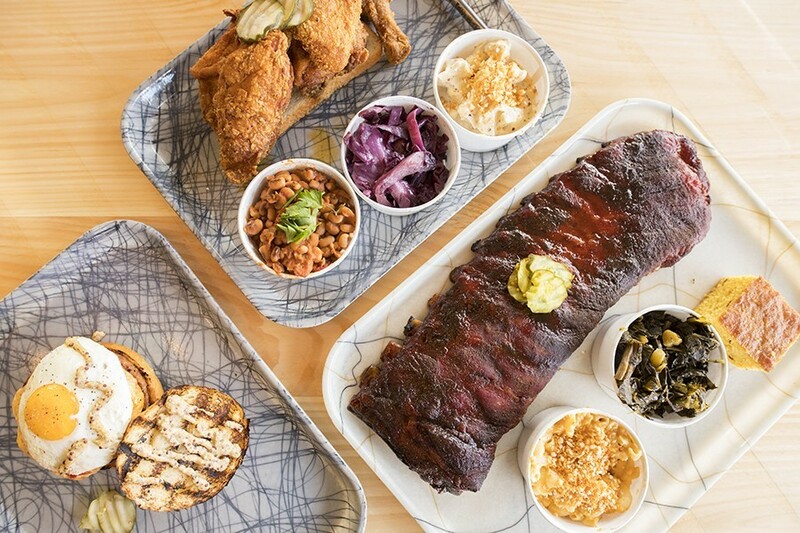 Grace Meat + Three's highlights include fried chicken, Duroc pork ribs and a thick-cut grilled bologna sandwich. 4270 Manchester Avenue; 314-533-2700. Wed.-Sun. 11 a.m.-8 p.m. (Closed Monday and Tuesday). 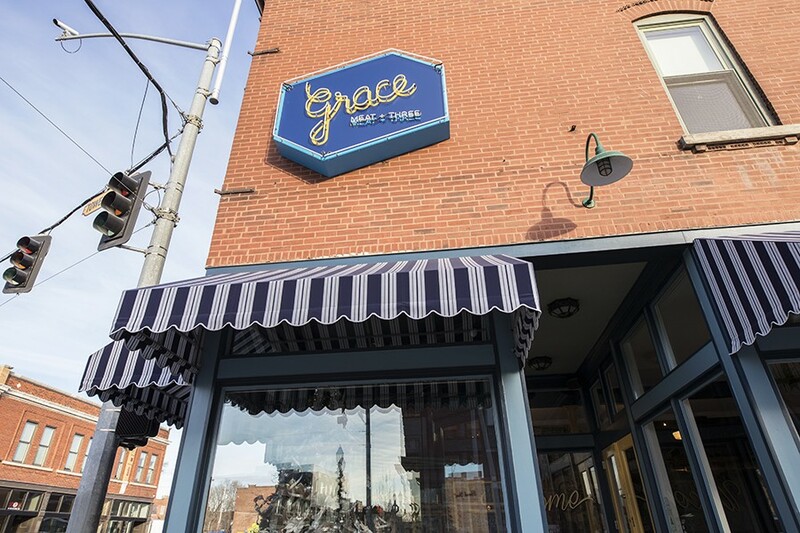 If you see chef Rick Lewis working the dining room of Grace Meat + Three — which he does during every service — don't compare the turkey leg to the one at Friar Tuck's at Six Flags. Or, if you do, just know that you are not the first one to make the joke. "Do you know that everyone talks about that?" Lewis offers after overhearing me reference the amusement park's medieval-themed turkey-leg stand. "Probably every person who orders this asks me if it's as good as Friar Tuck's. I didn't think that was a very high bar to reach, but apparently that place really means something to people." Lewis need not worry about the competition. His version of the carnival staple doesn't just meet the Friar Tuck's bar; it launches past it with the velocity of the Screamin' Eagle. Brined in sweet tea to give it just a hint of sugar and spice, the leg is then cooked in its own fat; the impossibly succulent meat slides off the bone if a fork so much as comes within inches of it. The exterior is caramelized to a golden brown, which gives a touch of crunch and concentrates the flavor, and a parsley-heavy tapenade of fresh herbs cuts through the meaty decadence, giving each bite a bright finish. Forget renaissance fair snack food. This is the sort of feast you'd be presented by the king after slaying Beowulf. At Grace Meat + Three, customers order at the counter. If Lewis gets tired of hearing the same old jokes about his food, he doesn't show it. In part, this is because he and his wife and co-owner, Elisa, are consummate hosts whose goal is to create a dining space that feels like an extension of their home. Mostly, though, it's because the Lewises recognize that food striking a nostalgic, visceral chord with people is their niche. He calls it "blue-collar cooking," saying it's "the original farm-to-table, where cooking was about serving meals based on what was available directly from the field to the workers." And if you tell the couple that their fare reminds you of something you gnawed on while waiting in line for Thunder River, their response is not to be offended — it's to offer a sincere thank-you. Lewis' culinary beginnings did not foreshadow his future as St. Louis' king of comfort food. After working his way up in the kitchen at the Italian mainstay LoRusso's, he got an education in fine dining under Josh Galliano at Larry Forgione's iconic An American Place. Lewis followed Galliano to Monarch, where he honed his craft until the restaurant closed in 2012. His tenure at two of the city's most prestigious restaurants meant Lewis could have gone to just about any white-tablecloth spot after that. But his soon-to-be in-laws needed a chef for their south-city restaurant, Quincy Street Bistro, and Lewis took a different path. His new bosses weren't interested in turning their neighborhood bar and grill into fine dining; they simply wanted to do comfort food well and thought he was the person to do it. He took them up on the challenge, applying the techniques and polish from his previous jobs to down-home cooking, earning a semifinalist spot for the James Beard Rising Star Chef of the Year award in the process. 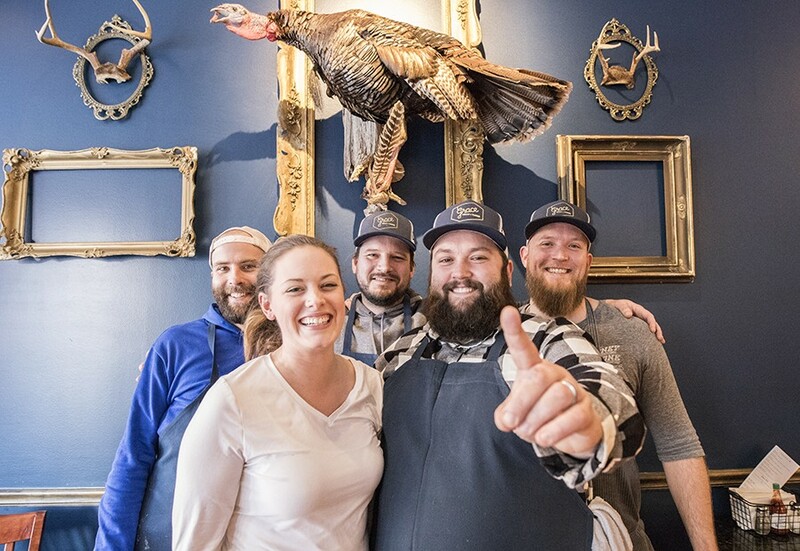 Co-owners Elisa and Rick Lewis are flanked by (back row from left) chef de cuisine Kevin McCulloch, pit boss Chris Maugh and sous chef Daniel Poss. 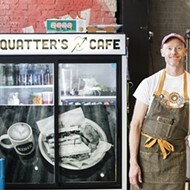 Now married, Rick and Elisa Lewis left Quincy Street when Pappy's Mike Emerson presented them with an opportunity to do a sister concept in the space adjacent to his smokehouse. 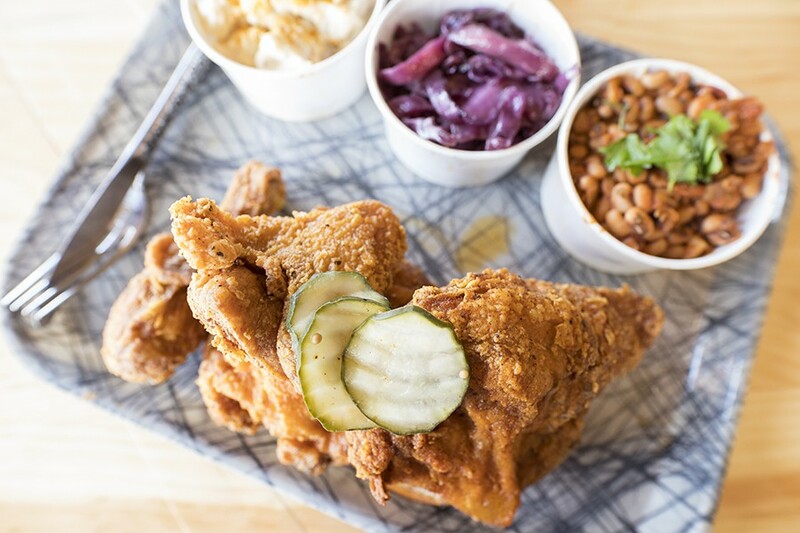 That restaurant, Southern, became a sensation just as hot as the Nashville fried chicken it served, sealing chef Lewis' reputation. 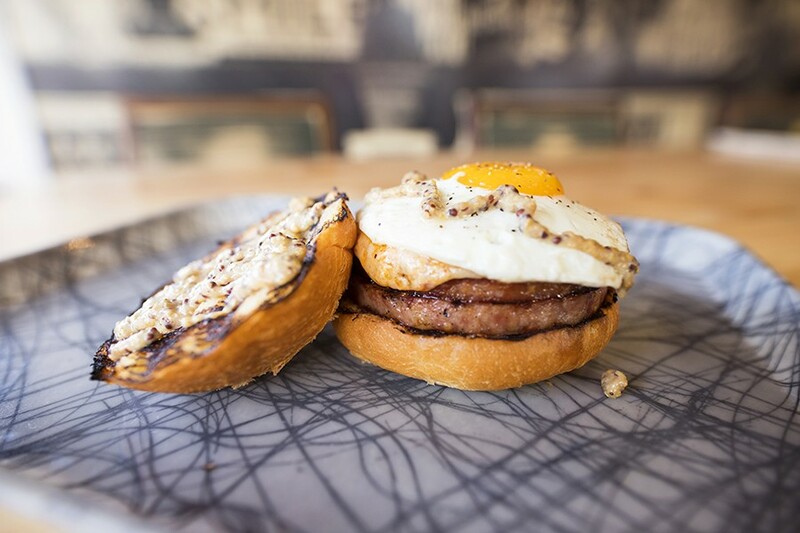 This summer, the Lewises announced they were leaving Southern to pursue a concept fully their own, one that would build upon what they'd created at their two previous eateries. 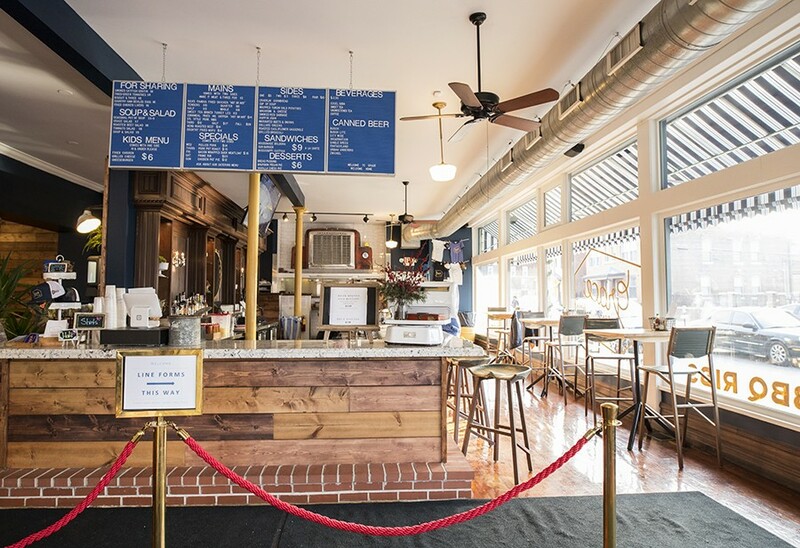 In September, they opened Grace Meat + Three in the former Sweetie Pie's space in the Grove as a venue for Lewis to show off what he can do with the comfort food genre. The building has not changed substantially from the Sweetie Pie's days. The Lewises kept a similar layout as the former occupants, with a large, vintage wooden bar and counter and an adjacent overflow dining room. They even kept the iconic St. Louis-themed mural that hung at Sweetie Pie's, though the remainder of the décor has changed. The walls have been painted a rich blue that's a cross between navy and peacock and are hung with rustic-themed artwork, including a living wall of leafy green plants and a taxidermy wild turkey. Knotty pine boards cover one of the walls, and seating consists of a mix of communal and individual tables and a handful of wooden banquettes. The grilled bologna sandwich is topped witih pimento cheese, a sunny-side-up egg and house mustard. Diners order at the counter from the kind of interchangeable lettered menu boards you'd see at an old-time cafeteria. During dinner hours there may be a slight line, but nothing that will keep you standing much longer than five minutes. You won't wait long for your food, either; Lewis has figured out how to stay ahead of the orders without sacrificing quality. The setup gives the feel of a nostalgic country dining hall, but as with the turkey leg, a refinement lurks just below the surface. Consider the meatloaf, one of the week's rotating blue-plate specials. Just like Grandma's, the dish consists of tender meat wrapped in bacon. Lewis' version, however, is made from duck — 70 percent meat and 30 percent fat to give it a pate-like texture. The meatloaf is covered in a sweet soy glaze, which makes the dish reminiscent of a duck potsticker, minus the wrapper. It exemplifies the beauty that can result from mixing high-end techniques with humble dishes. "Rick's Famous Fried Chicken" isn't Nashville hot, but it's still damn good. Herb-roasted beef may look like something off a smorgasbord line, but the execution is right out of a Michelin-starred dining room. Slices of fork-tender meat are covered in a bone marrow and mushroom gravy that's so rich, thick and concentrated with beef flavor, it's as if the entire essence of a cow has been distilled into sauce. A pinch of crispy fried leeks add crunch and a subtle punch of earth through the decadence. Working next to Pappy's day in and day out for two years must have allowed Lewis to soak up all the good barbecue vibes; his St. Louis-style Duroc pork ribs are the perfection of the form. The meat is cooked soul-food style so tender that it slides off the bone, caramelized on top for texture. The meaty coating is gilded with raw sugar and spice that's not quite a sauce but juicier than a rub. It mixes with the rendered pork fat to form a sweet and savory glaze that will have you licking your fingers in the middle of the dining room without shame. 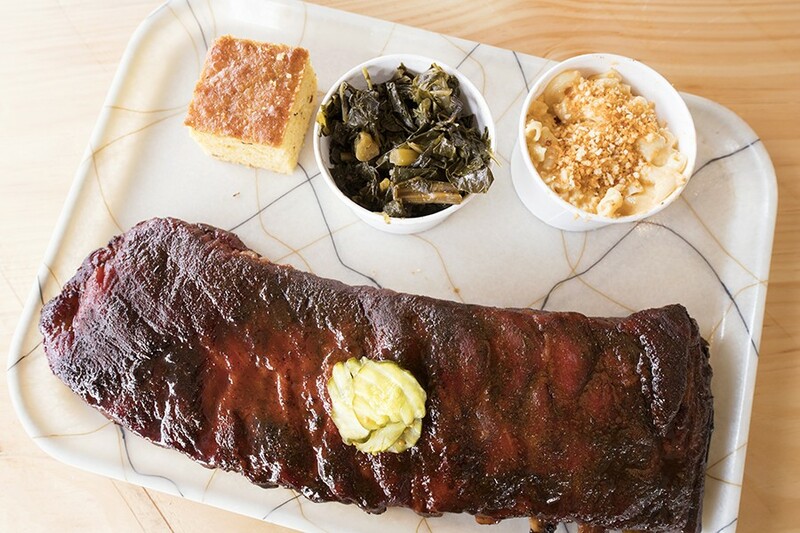 The Duroc pork ribs are cut St. Louis-style and served here with cracklin corn bread, collard greens and mac'n'cheese. Perhaps Lewis' biggest challenge with Grace was how to do fried chicken after running a place that serves the city's gold standard. 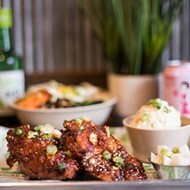 He didn't reinvent the dish completely, but if you are looking for Southern's fried chicken, you should go to Southern. If, however, you want fried chicken that's different from "Nashville hot" but still damn good, stay put at Grace. Lewis marinates the meat so that it soaks up flavor before it comes anywhere near breading. Before going into the fryer it's coated in seasoned flour that, if you order the spicy style, has a pop — not a wallop — of warm chile heat. It will make you sweat, but it won't make you scream — unless they are cries of joy. 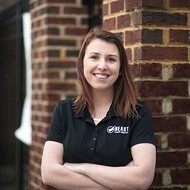 Grace's signature sandwich is the grilled bologna, a housemade meat that has about as much in common with Oscar Mayer as a McDonald's patty has with Kobe beef. The garlicky meat is sliced to the thickness of a hamsteak, then griddled to give it a bitter punch of char. The sandwich is covered in pimento cheese and crowned with a sunny-side-up egg. Finishing it might cause your heart to stop, though there are far worse ways to go. 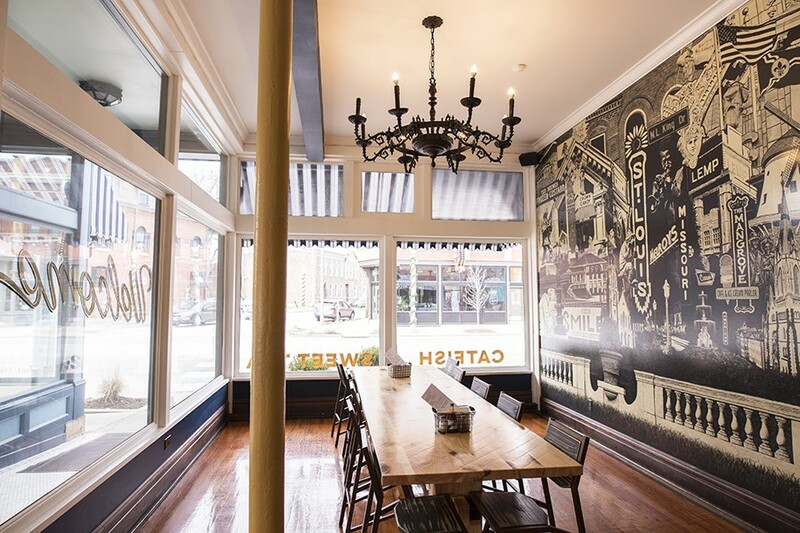 Seating options include a large communal table overlooking Manchester Avenue. 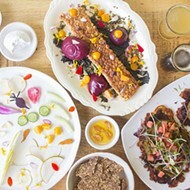 Part of the joy of dining at Grace — in addition to washing down Lewis' cooking with an excellent bourbon or rum cocktail from the bar — is getting to mix and match Lewis' quintessential country-style side dishes. All entrees come with a choice of two accompaniments (for $3 extra you can make it a true meat plus three), and he does his best to make it a difficult decision. Some are reminiscent of the Thanksgiving of your dreams: ambrosial bourbon-whipped sweet potatoes coated in toasted marshmallows, say, or the best green-bean casserole of your life (the difference that fresh beans and housemade mushroom soup make is shocking). Others show his penchant for high-low, like the mac and cheese, which is made from equal parts gouda and Velveeta. Then there's good old soul food, like cornbread infused with pork renderings and glazed with honey, and collard greens infused with ham hocks and vinegar. Here's hoping his next concept is Grace Meat + Nine. As much as you want to fill up on sides, though, it would be criminal to leave without at least a few bites of Lewis' bourbon pecan pie. Unlike most renditions of the dessert, his is heavier on the pecan and easier on the corn-syrupy goo, which makes it pleasantly less sweet. His banana pudding is another signature, silken and filled with hunks of fresh bananas. The real joy is the sesame cookie garnish. The nutty, cracker-like confection tastes as if a master pastry chef had tried his hand at those nutty sugar cookies you get off the Chinese buffet. Really, though, that's about as apt of a description of Lewis' cooking as it comes: familiar, and decidedly un-fancy, foods expertly refined to be the best versions of themselves. And it doesn't take a whimsical summer day and a trip down the Log Flume to make them taste so sweet — Lewis does a good enough job of that all on his own.